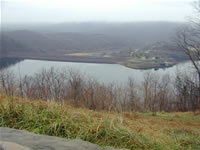 LOCATION.--Lat 40`26'06", long 78`00'25", Huntingdon County, Hydrologic Unit 02050303, at Raystown Dam on Raystown Branch Juniata River, 3.5 mi south of Huntingdon, and 5.7 mi upstream from mouth. REMARKS.--Reservoir is formed by earthfill dam with a gated spillway in right abutment at elevation 768.6 ft (capacity, 383,500 acre-ft), and an ungated spillway separate from embankment at elevation 812.0 ft (capacity, 762,000 acre-ft). Storage began November 1972. Conservation pool elevation is 786.0 ft, capacity 514,000 acre-ft. Lake is used for flood control, low-flow augmentation, and recreation.